Apiculture (bee-keeping) in Uganda is an important seasonal activity that remains largely unexploited despite the potential it has to widen Uganda’s export base. A country-wide survey (UEPB / MAAIF March 2005) indicates that only 3 products i.e. 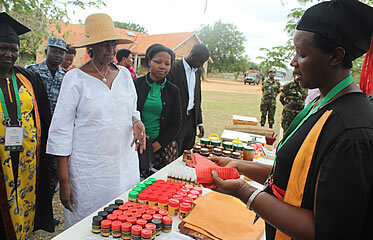 honey, bee wax and propolis are produced in Uganda. Other bee products such as pollen and venom are completely unknown and have never been traded in. At a small scale, the beekeepers have the capacity to separate honey from the combs and make bee wax, but it is difficult to extract other products. This is due to lack of skills training for beekeepers. Although the demand by the local markets is undocumented, there is evidence that a big local market exists to an extent that a lot of honey is imported from the neighboring countries. Further evidence states that there is potential for Uganda to make and export over 500,000 metric tones of honey per year (Prof. Helmut Horn, 1999) if bee keepers are availed with the necessary skills. To drive transformative skills, knowledge, technology, innovations, SMEs (Small-Medium Enterprises) and services into the bee keeping industry and in partnerships, continuously improve production, health, employment, community wellbeing and economic growth. To produce graduates with the skills in planning when to harvest various products based on colony cycle, selecting areas suitable for apiculture, bee handling, queen rearing, packaging and marketing bee colonies, multiplying and marketing seed colonies, controlling and detecting bee diseases, making various bee products and marketing of bees and bee products. Minimum Programme Duration: One year for Certificates, two years for diplomas, and three years for degrees. Target group: Those interested in building attractive industrial, business, professional and service careers associated with the apiculture industry. For artisan skills development certificate, the minimum is a school leaver with a good grade. For professional skills qualification (ordinary certificate, ordinary diploma, and degree), the minimum is an ordinary level certificate. Graduates of tertiary institutions and farmers are encouraged to apply because this program is designed to nurture skills, employment and enterprises for all. O-level certificate entrants will undertake a bridging course when proceeding from diploma to degree level. Visit the AFRISA Secretariat in the Veterinary Complex,Makerere University Main Campus.